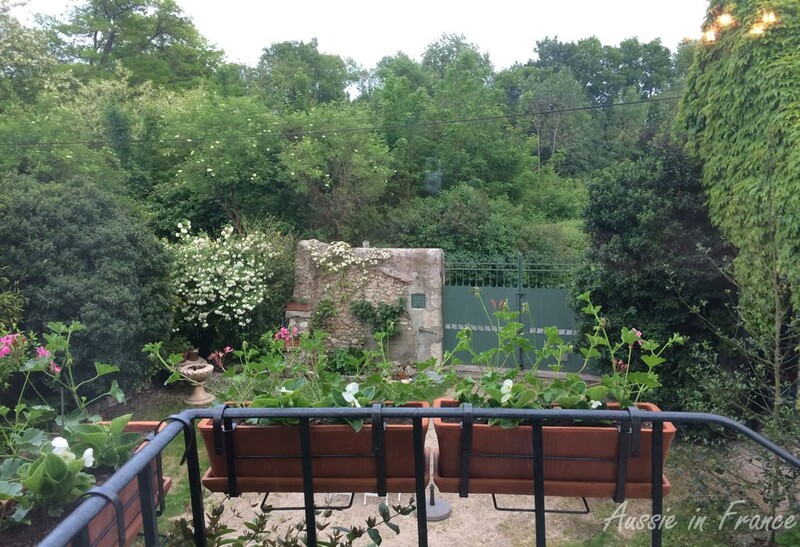 I have never had any doubts about moving to Blois despite the dreary winter but spring in our garden and the surrounding villages and countryside is just so wonderful that I don’t think I could ever spend it anywhere else! 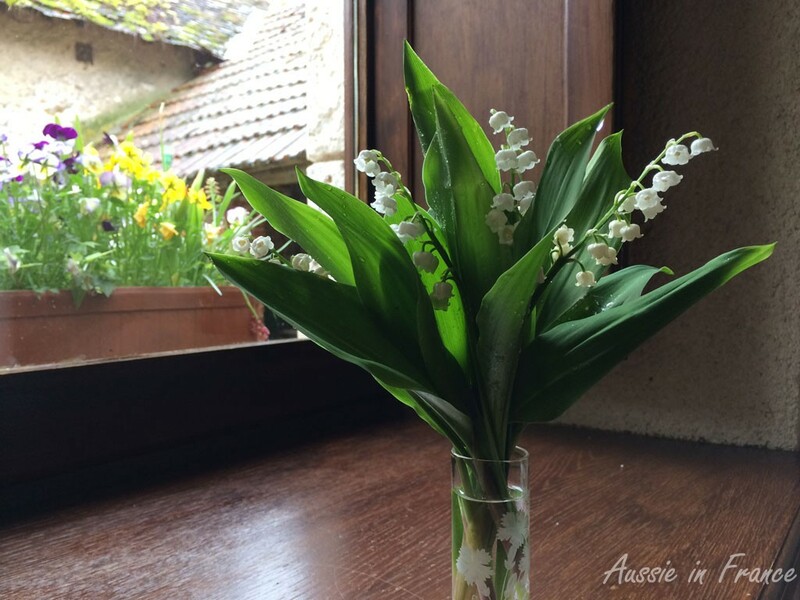 Let me share some of our May flowers with you starting with the traditional lily-of-the-valley that Jean Michel picked for me in the garden. 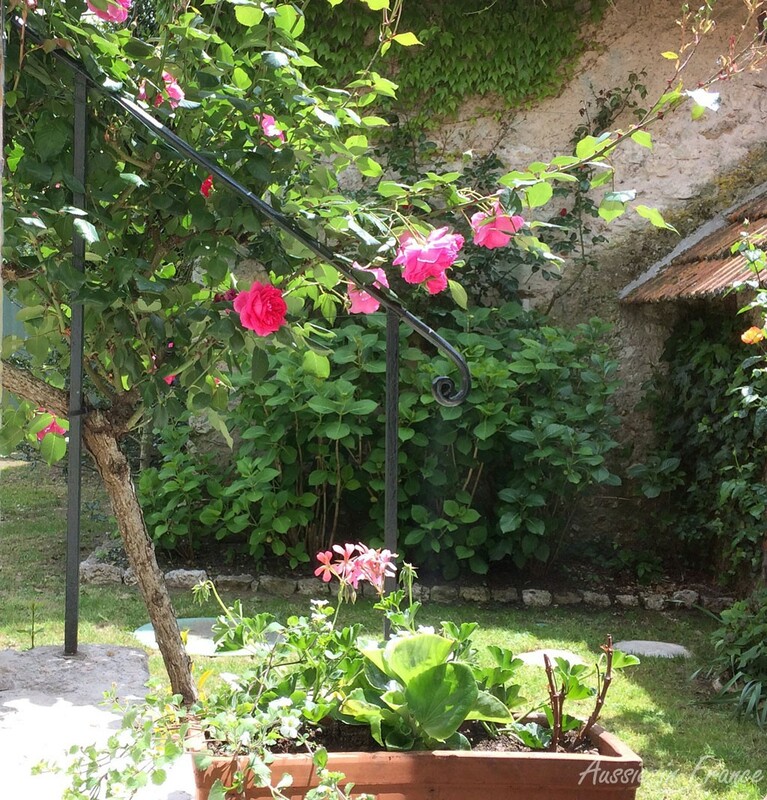 Next come the Ronsard roses, viburnum and irises outside our front gate. 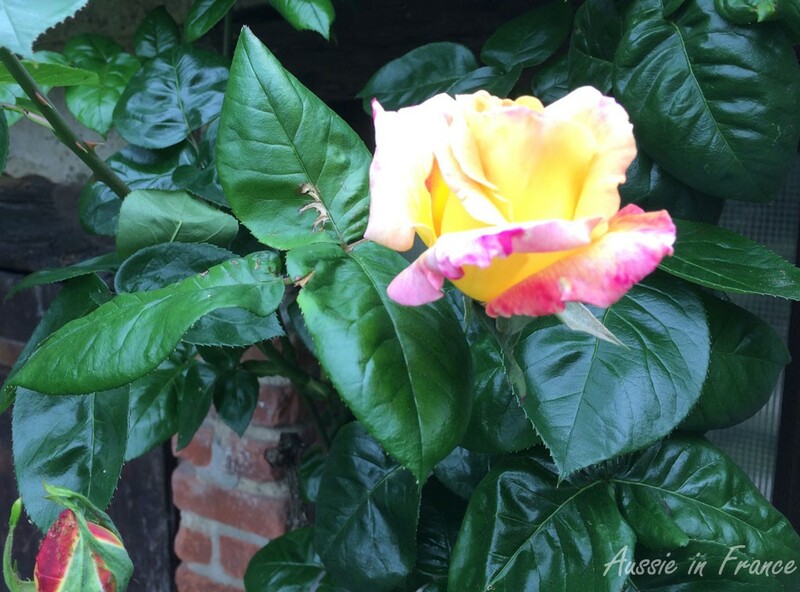 Followed by the first rose to bloom – the Peace Rose. It has no scent but I love the colours and the story behind it. Only one flower seems to bloom at a time. 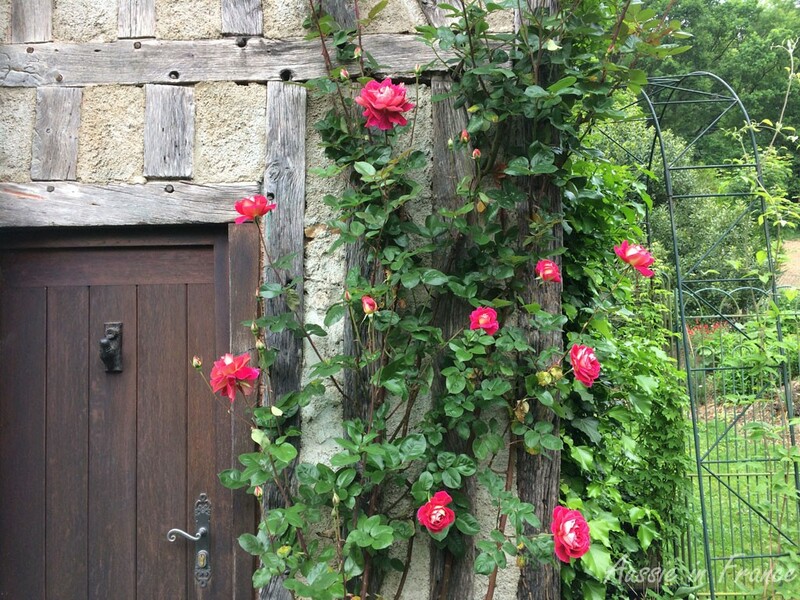 The climbing roses on the half-timbered tower at the corner of our house flowered next. They don’t have any scent either but are very romantic. I love the weigela for its abundance. It grows at one end of our vegetable garden and is a little bit hidden away but will be very visible from our future kitchen side window. And just look at the next one – it’s wattle, isn’t? I brought back seeds one time but had no success. Then I discovered we already had one in our little wood! I took this photo on a rainy day. You can see the clematis on the wall which we planted two years ago and are very proud of. However, there is an armandii clematis which has been less successful. I accidentally broke the flowering end and it’s been sulking ever since. 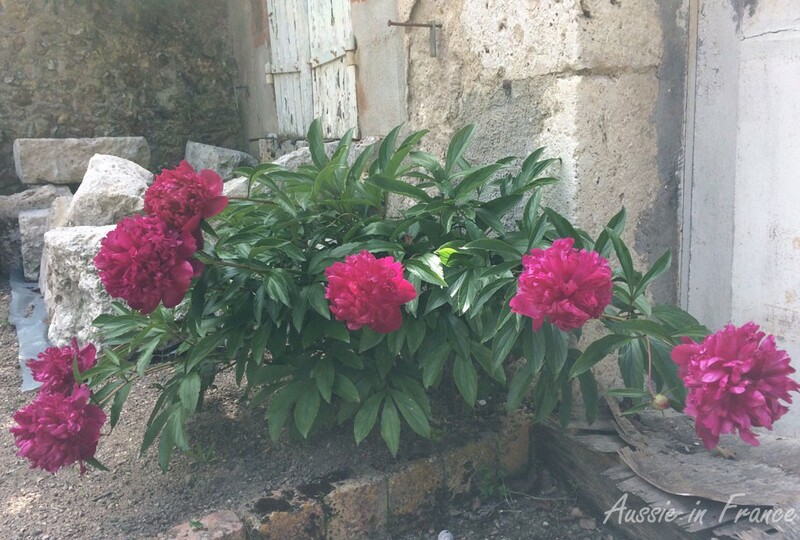 These are the peonies in the little house next door. I’m going to try dividing the tubers in autumn. The roses below are my favourites and bloom right up until December but May/June is the best period. And below is the view out of my office room this morning – it corresponds to the window on the left in the photo above. 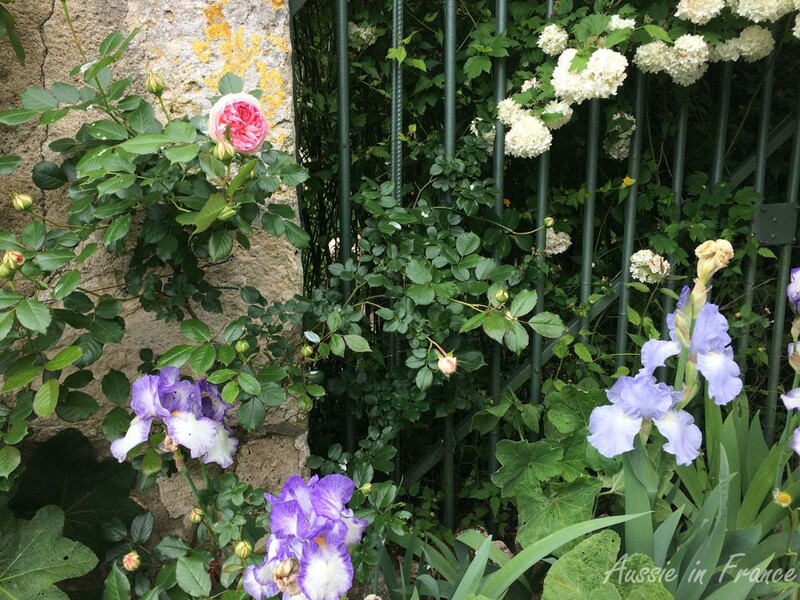 This entry was posted in Blois, Closerie Falaiseau, Flowers & gardens and tagged flowers in may in france. Bookmark the permalink. Spring as it should be. Absolutely breath taking. Some 25 years ago when we built our 1st home, I tried to create a cottage garden. A lot of money spent for no reward. So lovely to walk through yours. Oh Helen, that so reminds me of my mother who tried desperately in North Queensland, to have a cottage garden. She even tried a strawberry barrel! She was very successful with orchids though and I now grow them INSIDE my house! Viburnum… that’s what it’s called. 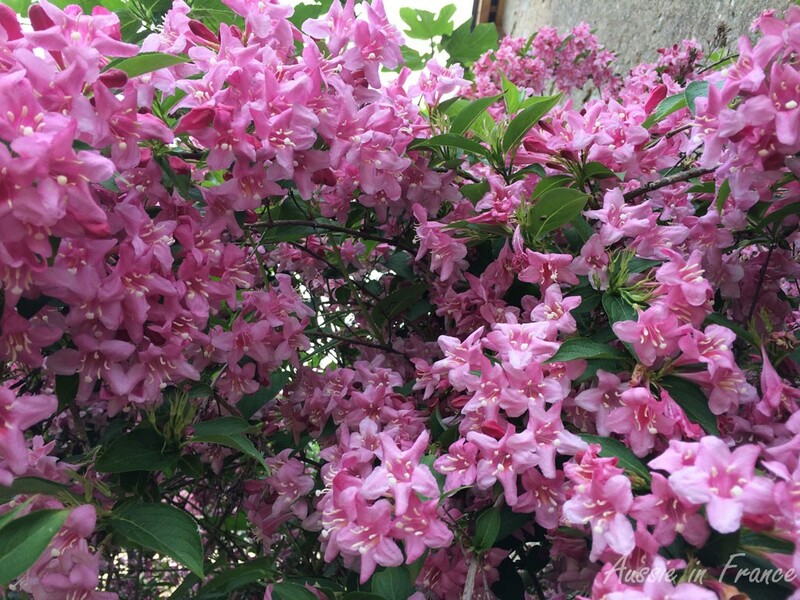 We had a bush that blossomed like that in our front garden when I was growing up. It’s so beautiful. I had never seen them until I came here – we had hibuscus in our garden when I was growing up! Just a note to say how much I enjoy every one of your posts and look forward to them. These photos of spring flowers are absolutely beautiful – thank you for sharing them. I have now crystallised plans to spend next late April/May in France to see spring there in person. Hello Annette, thank you so much for your comment. I am delighted to share my garden! 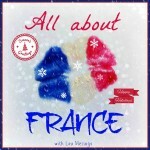 I hope you will have a wonderful time in France next spring! Maybe we’ll meet up! What a beautiful garden you have. I really enjoyed having a look at the stunning colours and blooms. The yellow plant with the pea shaped flowers is related to wattle, but wattle flowers are more generally small round fluffy yellow balls! I have many of these flowering in my garden at the present, their perfume is amazing! Wattle is such a strange flower. When I first arrived in France and was shown mimosa, I thought it was wattle, then when I went back to Australia one spring, I was shown another flower that looked like my photo and told it was wattle! 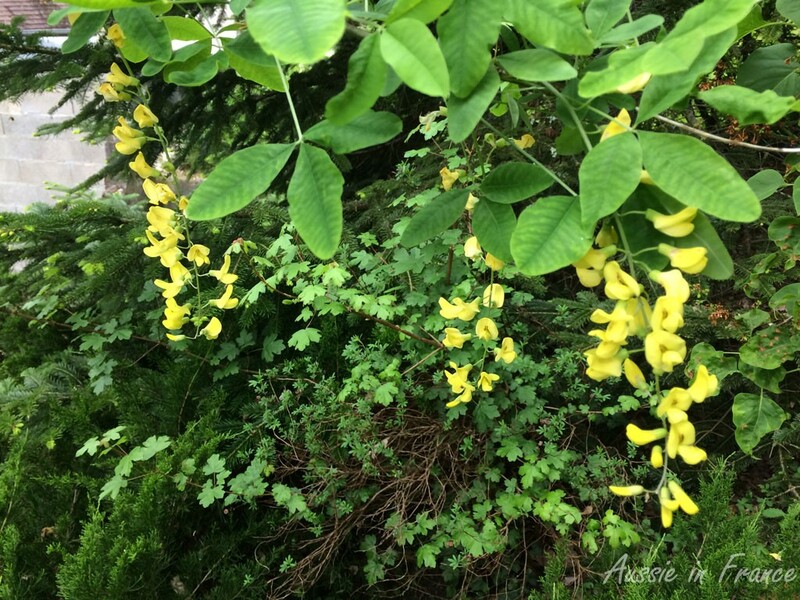 The yellow flowering tree is laburnum. It’s not related to Wattle Acacia (Fr. mimosa), but to False Acacia Robinia pseudoacacia (Fr. Acacia). I always say to people May, beginning of June is the best time to be here. The flowers in gardens and the wild are just stupendous. I was out yesterday with one of my local orchid experts. We saw 16 species of orchid without even trying very hard. Fantastic! Plus everything else that is in flower at the moment! So that’s laburnum! We know what Robinia is but didn’t realise it was related to this tree. As I said in my comment to Madoqua, we were shown another tree in Australia in Townsville that people said was wattle. Now I’m totally confused! How wonderful to see 16 different species of Touraine orchid. As far as I can see, we have three, but the number has increased dramatically in the last couple of years. I counted more than a hundred this year in quite a small patch. Jean Michel is careful not to cut the grass until very late and he’s been getting rid of all the ivy and weeds in that area. Wonderful flowers! Your garden pictures are beautiful. I love spring because at that time there are a lot of blooming flowers. Thank you Amanda. I so love my garden! What gorgeous flowers! This post makes me dream of spring (which has not quite yet arrived in Montreal…). I especially love those roses! Thank you. The spring seems very short in Canada. I find winter here is too long. I don’t know how I’d manager. It took me many years to get that view! What a beautiful post. 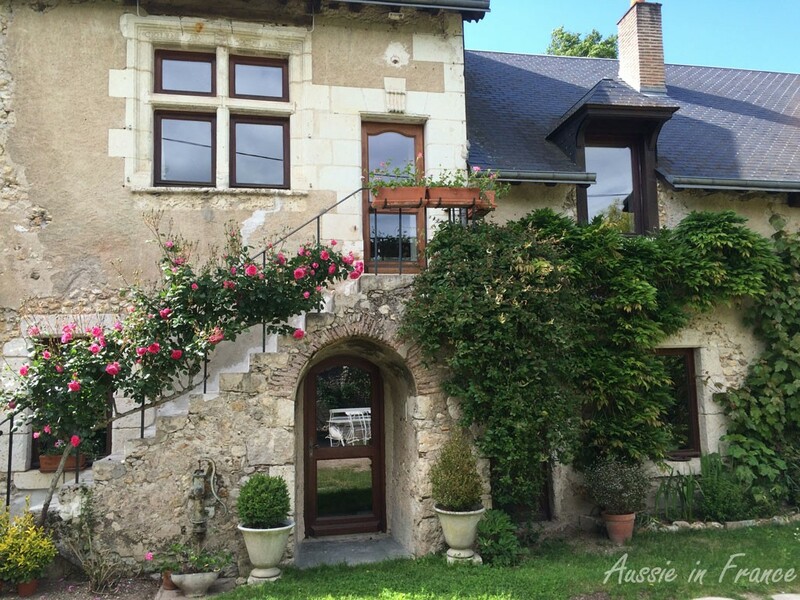 I haven’t been to the Loire Valley in years, but we were there in spring and it’s just magical! Great photos. Thank you Corinne. The Loire is a lovely place. One of the advantages of living here is the garden – though I could do with a lot more sun especially at the moment. Rosemary, I like your garden. Your garden is so nice. Hope one day I will also have such a nice garden. I wish you good time.